Vanee Honey BBQ Sauce is a slightly sweet, slightly tangy barbecue sauce begging to be paired with everything from burgers to pulled pork to brisket. Great for barbecue applications, burgers, or as a dipping sauce or condiment. 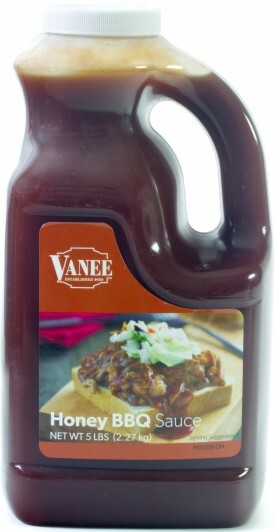 Vanee Honey BBQ Sauce has no high fructose corn syrup, and comes conveniently packed in half-gallon, pour-friendly jugs; simply shake, pour, and serve. Each half-gallon jug yields 60 two-tablespoon servings, for 240 servings per case. 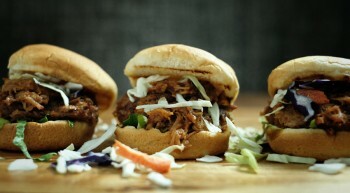 Perfect for barbecue applications, burgers, or as a dipping sauce or condiment. 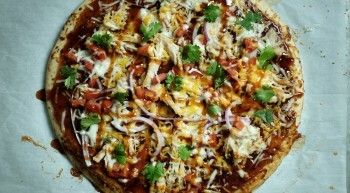 Concentrated Tomato Juice, Honey, Brown Sugar, Vinegar, Sugar, Food Starch - Modified, Salt, Natural Smoke Flavor, Spice, Worcestershire Sauce [(Vinegar, Molasses, Corn Syrup, Salt, Caramel Color, Garlic, Sugar, Spices, Tamarind, Natural Flavor) and Maltodextrin], Potassium Sorbate (Preservative), Sodium Benzoate (Preservative), Caramel Color, Xanthan Gum, Onion Powder, Garlic Powder.